With the exception of KARZAHNI and TOA LESOVIK (names may be misspelled), you can currently find all of the Titan/Warrior sets, the Mahri, and the three playsets. Many reliable sources say you can find the missing two in the LEGO� brand stores. Forum link. This news comes from our U.K. reporter PREDATOR, who also reports sales at his local stores in this topic. I didn't misspell them after all, but I did misspell "misspell"
LEGO� S@H for the USA now lists two of the three playsets as available, with the third and fourth (the fourth being the collection of the three) still on preorder. Found here, the last playset and the Mahri Nui collection are now available to U.S. customers on LEGO� Shop At Home. Thanks goes to Xaxnxost for this update. Also, keep a look out, Im planning a contest to celebrate Mask Of Destiny's birthday that I managed to forget about with all the Mahri updates. Today I have just found out that Brickshelf, the Lego Image hosting site seems to be down for good. The Site Now has 'Brickshelf has discontinued operation. We apologize for any inconvenience.' written across it. I advise all members that if they have some BIONICLE� or LEGO� work that they back it up on their home system or place it in another Image Hosting site. Forum Link. UPDATE: Brickshelf will now Close on the 31st of July, so for whoever has any work which they haven't got on their homesystem are advised to save it. Thanks to Weremagnus for this Information. I'm not sure what turn of events took place, but Brickshelf appears to still be operational today, ten plus years from their reported demise. Earlier today Imatron received Maxilos and Spinak through LEGO� Shop At Home, but halfway through uploading the pictures the computer had some technical difficulties. He did want to note that Spinak's Head is not a mask but a part similar to the Barraki heads. When Imatron gets his computer problems fixed he can fully review it. Fun fact, I seem to emit a field that is detrimental to electronics. It's not been as bad as it was ten years ago, but I still have to wear mechanical watches. Seth Huy and Xanxost report that Lesovikk and Karzahni are available now, (at the time this was posted) and hidden, strangely, in the Titans section rather than the Warriors section...I wonder how long they've been in there for? I suppose technically Karzahni is more of a mechanic, so maybe Warriors was the wrong section for him after all? Still, I don't see how Lesovikk is more of a Titan than a Warrior, as Toa tend to fight things. 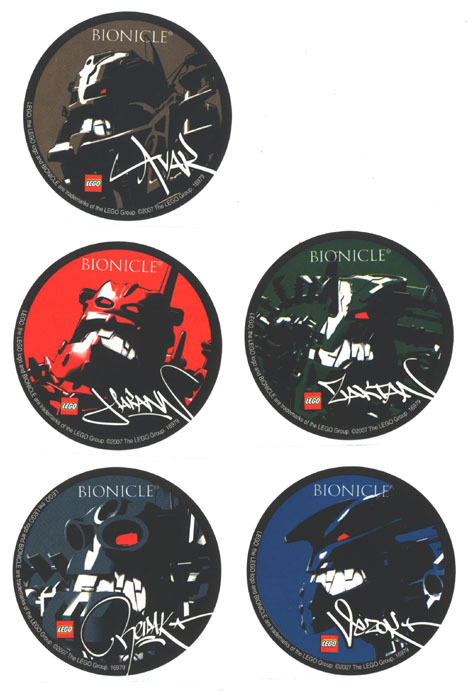 I finally had a reason to order something else from SmileMakers.com, so I finally ordered some PIRAKA stickers. Poor THOK got left out somehow, but then again he always was a loner. Myabe Thok is there and they just forgot to shade him? The latest comic, BIONICLE�: Ignition Number Nine, is now appearing in mailboxes. BIONICLE�: Legends #7 � Prisoners of the Pit has been out for some time now. I read it a few weeks back, and I have been thinking about reviewing it ever since. Today, I bite the bullet. UPDATE: I've added my description and thoughts to Maxilos And Spinax set. Vahiki-117 reports a new movie on www.BIONICLESTORY.com, and some interactive menus featuring the Toa MAHRI.